Read this article to know more about Windows 8 Photo App and to follow step by step instructions on how to get Facebook photos to Windows 8 Photo App. Microsoft recently released Windows 8 Consumer Preview. In Windows 8 we can find many new features. Photo App is one among them. With the help of Photo App, one can integrate their Photos which or in the websites like Facebook, Flickr etc. Photo App also integrates with Windows Charm which intern helps users in searching, sharing and printing. 1) Go to Photo App and click on the title of the service which you want to connect. 2) If Windows 8 Consumer preview Prompt's you to Sign-in with your Windows account, enter your id and credentials to sign-in to Windows account. 3) After signing into the Windows account, click on the website from where you want to retrieve your photos. 4) Now, Sign into Facebook/Flickr account and follow the on screen instructions and authorize the websites. 5) When you are promoted with You're ready to go, click on done. 6) At this step, you will be redirected to the Photo App in your system. It takes few minutes of time to appear the photos in the Photo App. 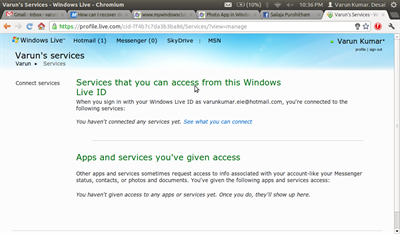 7) One can check whether they given correct permission for the Photo App by visiting Microsoft's Profile page. If you gave correct permission, you can see Photo App in the service list. I've got 103 photo albums containing over 5,000 photos on my Facebook page. However, it will only download 100 album names and only about 2,100 of the photos. Is this a known issue?